A Russian Progress cargo ship bound for the International Space Station was successfully launched from Kazakhstan early Wednesday, but the approach of a SpaceX Dragon cargo ship launched Sunday from the Kennedy Space Center was aborted because of an apparent problem with the spacecraft’s GPS navigation system. SpaceX flight controllers suspect the abort might have been triggered by an incorrect “state vector,” the set of numbers that defines the spacecraft’s orbit and trajectory. If the problem can be resolved, the Dragon, loaded with nearly 5,500 pounds of supplies and equipment, could attempt a re-rendezvous Thursday morning. In the meantime, the spacecraft is operating safely in a holding pattern a safe distance away from the station while SpaceX engineers and flight controllers at the company’s mission control center in Hawthorne, Calif., continue troubleshooting. “The SpaceX Dragon, a commercial cargo ship, has aborted its rendezvous for the day,” said Rob Navias, NASA’s mission control commentator at the Johnson Space Center in Houston. “There will be no rendezvous, no capture today by the crew members on board the International Space Station. At the time of the abort, the Dragon was about seven tenths of a mile below the station, beginning to climb up to the lab complex so European Space Agency astronaut Thomas Pesquet could capture the craft with the station’s robot arm. Grapple had been expected shortly before 6 a.m. If the problem turns out to be an incorrect state vector, the navigation system likely can be reset for another rendezvous attempt Thursday morning. But that is not yet confirmed. The Dragon was launched atop a SpaceX Falcon 9 rocket Sunday from the Kennedy Space Center, the company’s first Florida launch since a spectacular explosion Sept. 1 at the Cape Canaveral Air Force Station that destroyed another Falcon 9 and its communications satellite payload. Mounted in the capsule’s pressurized compartment are 3,150 pounds of supplies and equipment, including 580 pounds of crew food and clothing, 842 pounds of spare parts and other vehicle hardware and more than 1,600 pounds of science gear. Twenty mice also are on board to help researchers learn more about what processes prevent most vertebrates from regrowing lost limbs or tissue. Also on board: methicillin-resistant Staphylococcus aureus, or MRSA, in an experiment to learn more about how the deadly bacteria mutate to design more effective drugs. Mounted in the Dragon’s unpressurized “trunk” section are another 2,100 pounds of equipment: a $92 million ozone monitoring instrument, a $7 million sensor to monitor lightning strikes and experimental gear designed to help engineers perfect autonomous rendezvous and docking software. The Dragon originally was scheduled for launch last Fall, but the flight was delayed in the wake of the Sept. 1 launch pad failure, along with several other SpaceX payloads. NASA expects three more SpaceX cargo delivery missions to the station in April, August and November, along with two flights by Orbital ATK’s Cygnus cargo ship in March and October. Russia plans to launch three Progress supply ships this year. The first of those took off early Wednesday aboard a Russian Soyuz-U rocket making the venerable booster’s final flight, three months after an upper stage failure destroyed another station-bound freighter. Mounted atop a snow-covered launch pad -- the same pad used by cosmonaut Yuri Gagarin at the dawn of the Space Age -- the Soyuz-U rocket carrying the Progress MS-05/66P cargo ship thundered to life at 12:58 a.m. EST (GMT-5; 11:58 a.m. local time) and climbed away from the Baikonur Cosmodrome in Kazakhstan. Streaking through a cold, cloudless sky, the booster arced away to the east, climbing directly into the plane of the space station’s orbit. Four liquid-fuel strap-on boosters and the rocket’s central core stage performed normally, leaving it to the third stage RD-0110 engine to complete the push to orbit. 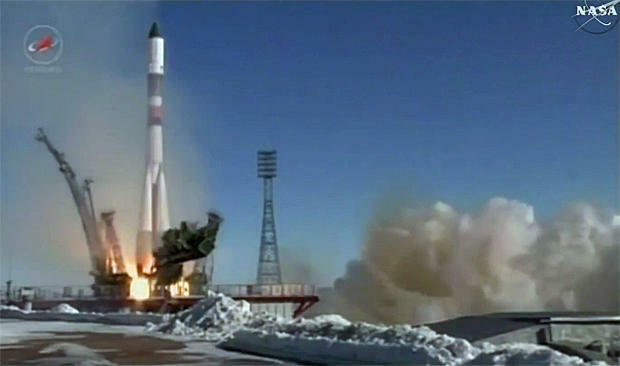 The most recent previous Progress launch on Dec. 1 ended in failure when the upper stage engine apparently malfunctioned, possibly because of debris sucked into an oxygen turbopump. But it was clear sailing Wednesday and eight minutes and 46 seconds after liftoff, the cargo ship was released into its planned preliminary orbit. If all goes well, the Progress will execute an automated approach to the space station, docking at the Earth-facing Pirs module around 3:34 a.m. Friday. On board: 1,763 pounds of propellant, 926 pounds of water, 51 pounds of oxygen and 2,900 pounds of food, crew supplies and other dry goods. The Russians are retiring the Soyuz-U rocket, first launched in 1973, in favor of an upgraded version, the Soyuz 2A.1, that features improved avionics but the same RD-0110 upper stage engine that is used in piloted versions of the rocket. In the wake of the December failure, the Soyuz-U launched Wednesday was subjected to extensive inspections, a new RD-0110 upper stage engine was installed and cameras were mounted on the rocket’s hull to document ascent performance -- a first for the workhorse rocket. The successful flight Wednesday is expected to clear the way for the return of three station fliers and the launch of two more in April. The Soyuz MS-02 spacecraft is scheduled to land in Kazakhstan on April 10, bringing commander Sergey Ryzhikov, flight engineer Andrey Borisenko and NASA astronaut Shane Kimbrough back to Earth after 173 days in space. Ten days later, on April 20, the Soyuz MS-04 spacecraft will carry veteran cosmonaut Fyodor Yurchikhin and NASA rookie Jack Fischer into orbit. They will join Expedition 51 commander Peggy Whitson, Pesquet and Oleg Novitskiy aboard the space station.